Saroj Khan is one of the most celebrated and awarded dancer-teacher-choreographer in Indian cinema. She is also the subject of a 57-minute documentary The Saroj Khan Story produced by the Public Service Broadcasting Trust and directed by young filmmaker Nidhi Tuli. Coming to this stage of her life took a rough, uphill climb that has seen the metamorphosis of dance in Bollywood cinema from the classical-based choreography in films like Ladki and Bahar through Helen’s sizzling numbers to the present-day item numbers that probably began with Madhuri Dixit’s “Ek do teen” number in Tezaab choreographed and directed by Saroj Khan and is continuing till this day. She excels in the Indian classical styles and in Western forms and all the colours of the choreographer’s palette between these two polarities — hip-hop, salsa, ballroom, Indian folk styles, fusion, item numbers, and any other dance style one can imagine. 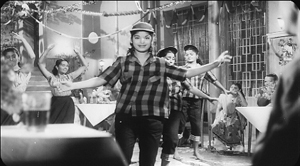 “I was in the back row chorus of a song-dance number in Bimal Roy’s Madhumati where Vyjayantimala was the lead dancer and the heroine of the film. It was a long struggle with many ups and downs in my personal life,” she says as she looks back wistfully. Her repertoire ranges from the purely classical numbers in Tamil film Shringaram — Dance of Love (2005) through the beautifully graceful numbers executed by Aishwarya Rai in Subhash Ghai’s Taal, to the sizzling duet performed by the lead pair in Rowdy Rathore (2012). Shringaram is special because it was directed by a noted dancer Saradha Ramanathan, produced by Padmini Ravi, a classical dancer and was a period film harking back to the 19th century on the life of a devadasi. Aditi Rao Hydari, a talented Bharatnatyam dancer played the role of the devadasi. Though the producer and director were both celebrated dancers themselves, they placed the onus of choreography on Saroj Khan, who won the National Award, one of her string of three National Awards for her choreography of the dance numbers in the film. Padma Bhushan Lalgudi G Jayaraman has composed the music for the film which also won the National Award. “The Madhuri Dixit number on the song “Maar dala” in Sanjay Leela Bhansali’s Devdas (2002) had the refrain maar dala four times in each stanza. I convinced and taught Madhuri to execute each refrain differently for each of the four times. This spread over to three or four stanzas and each time, she expressed this refrain differently,” explains Khan. This choreography also got her the National Award preceded by another National Award for the dance numbers in Hemant Gowarikar’s Lagaan (2001) alongside the Filmfare Award. A similar milestone is Bhansali’s Hum Dil De Chuke Sanam, which brought her a string of awards. Thus, from the background chorus of a dancer in her first film, in each decade of the Hindi film industry that followed, first as a background dancer behind the likes of Madhubala, then as an assistant teaching intricate steps to accomplished dancers like Vyjayanthimala, as the choreographer, who made Madhuri Dixit, the phenomenal dancer she is and till today as the legendary choreographer to next generation stars like Aishwarya Rai, Kareena Kapoor and Sonakshi Sinha.